Save the date for a big event with wine tasting, specialty foods and music from Puglia. The United Pugliesi Federation is sponsoring “Food, Wine and Music from Puglia” Tuesday, Sept. 15 in New York City. The event takes place at the National Opera Center of America, located at 330 Seventh Ave., between 28th and 29th Streets, 7th floor. Tickets are priced at $30 per person and may be reserved by calling 718-837-0876. Doors open at 7 P.M. and wines from Puglia will be featured. At 8 P.M. there will be a concert of piano four hands with the DUO MIROIRS, on their second U.S. tour, who will perform music by Ravel, Schumann and Gershwin. After the concert, at 9 P.M., there will be a catering of special foods from Puglia (and more wine, of course). Visitors to Puglia are benefiting from a free bus service linking principal tourist landmarks in the Province of Barletta-Andria-Trani. “Visiting the excellent and the most attractive places of our region has never been so easy and cheap,” Francesco Spina, president of the Province of Barletta-Andria-Trani, told La Gazzetta del Mezzogiorno. “La Linea Turistica” (“The Tourist Route”) operates every Saturday, Sunday and Monday through Oct. 30. It departs from Via Piazza dei Bersaglieri d’Italia in Andria at 10 A.M. “La Linea Religiosa” (“The Religious Route”) operates on Sundays, also through Oct. 30, and leaves at 8:40 A.M., also from Via Piazza dei Bersaglieri d’Italia in Andria. “La Linea Turistica” begins in the historic city center of Andria, home to beautiful ancient churches and monasteries and visits the ancient Barletta Castle (today a venue for theater and special events), Canne (site of a battle between the Romans and Carthaginians in 216 BC), the old town of Canosa di Puglia and Castel del Monte in Andria, built by Frederick II and now a UNESCO World Heritage Site and one of the major visitor attractions in Puglia. “La Linea Religiosa” also visits Barletta Castle and then continues to San Giovanni Rotondo, the city where Saint Padre Pio lived and worked, and Monte Sant’Angelo, the city of St. Michael the Archangel. Click here for further information and schedules. The Vatican announced on Monday that the remains of St. Pio of Pietrelcina, better known as Padre Pio, will be exposed for veneration in St. Peter’s Basilica during the Jubilee of Mercy Feb. 8-14, 2016. 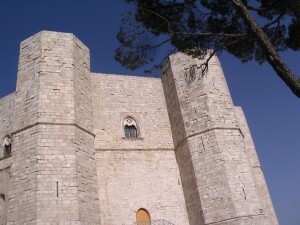 Archbishop Rino Fisichella, President of the Pontifical Council for the Promotion of the New Evangelization, wrote in a letter to the Archdiocese of Manfredonia-Vieste-San Giovanni Rotondo it was Pope Francis who desired that Padre Pio’s reliquary be present in the Vatican for Ash Wednesday of the Jubilee of Mercy. 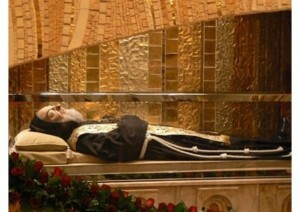 “The Holy Father has expressed his strong desire that the remains of St. Pio of Pietrelcina be exposed in St. Peter’s Basilica for Ash Wednesday of the upcoming Extraordinary Holy Year, the day in which he will send ‘Missionaries of Mercy’ throughout the world, giving them a special mandate to preach and confess so that they may be a living sign of how the Father welcomes all who seek his pardon,” Archbishop Fisichella wrote. You are currently browsing the Puglia Connection Blog blog archives for August, 2015.